Giuseppe Piazzi discovered Ceres [SEER.eeze] in 1801, and named it for a Roman agricultural goddess. For a long time people thought it was a planet, just like over a century later, they thought Pluto was a planet. But then astronomers found so many objects in the same orbit, they gave them a name of their own, asteroids. Even though Ceres is lots bigger than everything else in the asteroid belt, it's the smallest dwarf planet, barely a third the size of our Moon. But if Jupiter's gravity hadn't disturbed it, scientists think that Ceres could have become a rocky planet. Ceres is nearly three times as far from the Sun as Earth is. A year on Ceres is over four and a half Earth years. The distance from the Earth to the Sun is an astronomical unit (AU). Ceres is almost 3 AU from the Sun. At that distance, during a Cererian “heatwave” it can warm up to -38 °C (-36 °F). This is warmer than the average temperature of the interior of Antarctica, but the annual average temperature on Ceres is -100 °C (-148 °F). Next stop: Pluto. It's the biggest Kuiper Belt object, and in Greek mythology, Pluto was the lord of the underworld. The Kuiper Belt is like the asteroid belt, but much larger. It's also at least ten times farther from the Sun than the asteroids, and has icy bodies instead of rocky ones. Pluto's average distance from the Sun is 40 AU. That's forty times farther from the Sun that we are. It takes Pluto 248 years to get around the Sun. From Pluto, the Sun would look like a very bright star, though it still gets more light than we get when there's a full Moon. Pluto has five moons, four of which are really tiny. Its large moon Charon is named for the mythological ferryman who rowed the dead across the river Styx to Pluto's kingdom. Let's move on to Haumea (pronounced: how.MAY.uh) now. Its average distance from the Sun is 43 AU and its year is over 284 Earth years long. 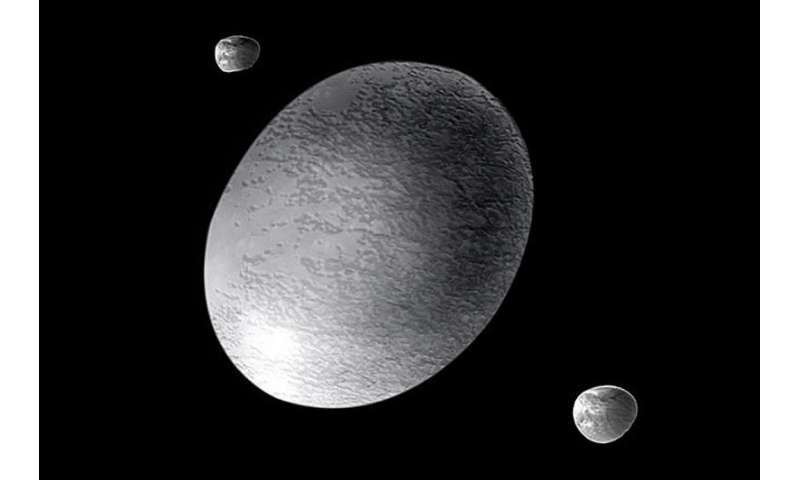 Haumea came originally from the scattered disk. That's twice as far away from the Sun as the Kuiper Belt is. A long time ago another object smashed into Haumea. That collision broke it into smaller pieces, started it spinning, and knocked it out of its orbit. In Hawaiian mythology Haumea is a goddess of fertility and childbirth. Her many children came from different parts of her body. This is a bit like the pieces of Haumea – two of them are moons, but there are also other fragments. Not only does Haumea spin, but it spins faster than anything else in the Solar System. Its day is less than four hours long. 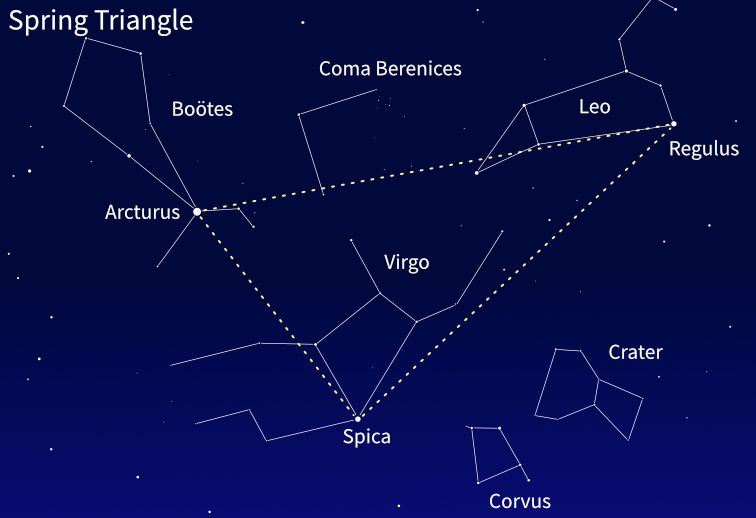 If a body rotates quickly, it bulges at the equator. Haumea spins so fast that its diameter at the equator is twice the diameter at the poles, so it's egg-shaped. In 2017 astronomers discovered that Haumea has a ring. It's the only object in the Kuiper Belt that we know is ringed. Makemake (pronounced MAH.kay.MAH.kay) was named for a fertility god of the Rapa Nui mythology of Easter Island. It's about 3 AU farther from the Sun than Haumea and takes 310 years to orbit once. It's the third largest dwarf planet, probably about three-quarters Pluto's size. A small moon was discovered in 2016. Our final stop is Eris, so we must leave the Kuiper Belt and enter the scattered disk. Remember this is where Haumea came from, but Eris is still there. For a long time Eris was the most distant known natural object in the Solar System. Its average distance from the Sun is 68 AU, but it gets as far as away as 98 AU. A year on Eris is 558 Earth years. However in 2018 an object was discovered at over 100 AU. Eris and Pluto are nearly the same size. The New Horizons mission to Pluto showed that Pluto is slightly bigger. When Eris was discovered in 2005, it seemed that it was a tenth planet for the Solar System. There was a big debate about this, but in the end Pluto and Eris both became dwarf planets. Some people weren't happy about that. Eris was the Greek goddess of discord and strife (disagreement and argument), so it was a good name. Eris had a daughter named Dysnomia (lawlessness) and her name was given to Eris's moon. Our tour is over now, time to get back to our nice warm Earth. There's no place like home – certainly not on any of the dwarf planets.